The Department is thinking small to develop new medical applications using nanoscience. Nanoscience is a study of materials at the nanometer scale (10-9 meters). To put that size in perspective, a red blood cell is about 8,000 nm in diameter whereas a bupivacaine molecule is about 1.4 nm in diameter. In addition, Dr. Dennis serves to direct college-wide activities of nanotechnology and to liaise these medical activities with the broader university community. 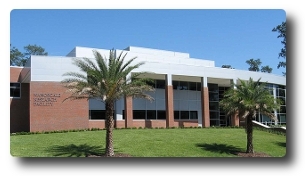 Recently, UF’s Nanoscience Institute for Medical and Engineering Technology (NIMET), an umbrella organization that coordinates nanoscale science and nanotechnology research and educational activities, completed the Nanoscale Research Facility (NRF), a 55,000 square foot building that centralizes nanoscience research throughout campus. The Department of Anesthesiology occupies four of the new laboratories and several offices in the NRF, located within a stone’s throw of the Health Science Center. At the NRF, these investigators are discovering novel methods of drug detoxification (as for local anesthetic overdose and cardiovascular collapse), identities of unique agents that appear in exhaled breath (such as propofol and other molecules in addition to carbon dioxide), and new drug delivery methods (such as propofol microemulsions). Increasingly, scientists in the Department find that their collaborations broaden to take advantage of the research opportunities arising at the interfaces of the traditional disciplines. Expanding anesthesiology to collaborate with chemists, engineers, and physicists working in nanoscience is just one example of how the Department continues its growth to discover new ways to help our patients.